The oldest beads, made of bone and shell, were found in French caves. They are thought to be 38,000 years old. Most early beads were made of organic materials – seeds, seed pods, beans – and so have deteriorated over time. Beads have long been tied to spiritual practices. The ancient Tibetans scratched designs in agate, blue beads being associated with having powers to keep ‘the evil one’ at bay. The Desert Fathers were in the habit of keeping track of their prayers by counting pebbles in their pockets or on string tied with knots. It is not known for certain which religious group first began associating the counting of beads with the saying prayers, but the Hindu faith has a 3rd Century BCE statue of a Holy man bedecked in beads, supposedly from those who were his disciples. The counting of beads while saying prayers is today one of the spiritual practices that can be found in some form in all faith traditions. Hindu prayer beads generally consist of 108 beads, often in 9 bead increments, with one larger bead, called a sumeru, from which to begin counting. The number 108 is sacred to Hindus, as it represents the number of names that belong to Brahma. A Hindu practitioner counts the beads as he or she recites the 108 names of Brahma. The string of prayer beads is called a ‘mala’, which means rose. The beads are often made out of sandalwood, though they can also be made of seeds, precious stones or metals. Muslims have sets of prayer beads called subhah, which is Arabic for ‘to exhault.” The subhah are used to mark the naming of the 99 names of God. 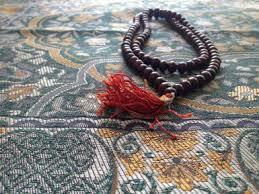 The subhah is generally in a strand of thirty-three, sixty-six or ninety-nine beads. This more easily keeps track of the names. The subhah can be recited any time of day, but for devout Muslims it is repeated after each day’s set of prayers – five times a day. The heart of prayer beads is intentionality. By turning to them throughout the day, it is possible to leave behind the business of the world, and have a tool that draws the person in prayer into their interior life, emerging from the prayer session refreshed. Beads are of this world, but their purpose, is to give us eyes to see God's world all around us.